The Toronto Maple Leafs travel to Amalie Arena to play the Tampa Bay Lightning on Wednesday, January 27, 2016. The opening line for this game has the Maple Leafs at +193 and the Lightning at -215. The over/under has been set at 5. Toronto comes into this matchup having played 46 games. They have an overall record of 17-20-9 and on the road they have a record of 10-12-2. Currently they are 7th in the Atlantic Division. They've scored 113 goals and given up 128 goals for a point differential of -15. Tampa Bay shows up with a record of 26-18-4 including 14-8-2 at home this season. They are 4th in the Atlantic Division. They've scored 129 goals and surrendered 117 for a goal differential of +12. James Van Riemsdyk has accumulated 29 total points this season for the Maple Leafs. He has 14 goals this season with 129 shots on goal giving him a shooting percentage of 11%. He has a total of 15 assists on the season and averages 18 minutes played per game. Leo Komarov has averaged 18 minutes of ice time per game this year. In that time he has a shooting percentage of 17% by scoring 16 goals on 92 shots. He has 15 assists giving him a total of 31 points on the season. James Reimer has 8 wins and 7 losses this season in net for the Maple Leafs. He has had 695 shots against him and has given up 44 goals. He has made 651 saves for a save percentage of 94%. 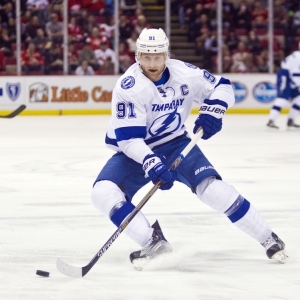 Steven Stamkos has accumulated 37 total points this season for the Lightning. He has 20 goals this season with 142 shots on goal giving him a shooting percentage of 14%. He has a total of 17 assists on the season and averages 20 minutes played per game. Nikita Kucherov has averaged 19 minutes of ice time per game. In that time he has a shooting percentage of 17% by scoring 20 goals on 119 shots. He has 21 assists giving him a total of 41 points on the season. Ben Bishop has 19 wins and 14 losses this season in net for the Lightning. He has had 982 shots against him and has given up 73 goals. He has made 909 saves for a save percentage of 93%. The Maple Leafs have 43 total points this season. They have scored 109 goals while giving up 123 goals. They have had 143 power play opportunities and have scored 23 goals on those chances for a percentage of 16%. The Maple Leafs have allowed 146 power play opportunities and given up 28 goals on those chances for a penalty kill percentage of 81%. They average 31 shots per game and as a team are shooting 7.64% for the season to this point. They allow 31 shots to their opposition per contest and have a team save percentage of 92%. The Lightning have a total of 56 points on the season. They have 30 power play goals on 165 opportunities thus far for a percentage of 18%. They have allowed 145 power play opportunities and have given up 28 goals on those chances for a penalty kill percentage of 81%. As a team, the Maple Leafs have a total of 127 goals scored while they've given up 114 goals to this point. They average 29 shots per contest and have a team shooting percentage of 9.13%. As a team they give up 28 shots per game and have a save percentage of 92%.